My husband and I went to Maui right after my mom passed. My mother-in-law got us tickets and we stayed at Mahina Surf - it was an awesome trip and I could think of the good times that I had with my mom. 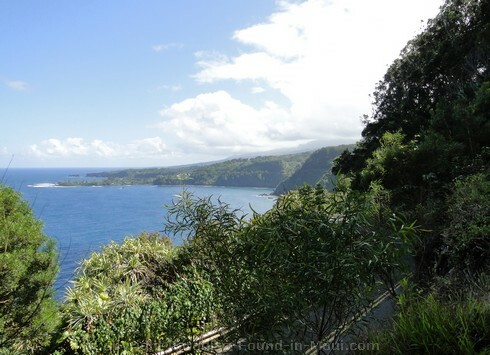 One of the days we went to Hana and did the jungle tour and the 7 pools. We had the best time ever - we went up to the top of the pools which was about a 2 hour hike, swam to a waterfall and went under the waterfall - it was the most amazing thing that I have ever done and seen. We got all muddy and rained on and got eaten up by mosquitoes but it didn't matter because I was in total paradise and nothing mattered at all. Thanks so much for sharing your story... the "7 Pools" at Oheo Gulch are truly amazing. Anyhow, glad to hear you had such a wonderful trip! Thrilled by the chance to spend some time in paradise, I was in Maui in June 1978 with my husband, son, and my parents. We were excited to be in Hawaii for brother Mike's wedding. After a pre-wedding feast while driving back to Mike's house in the mountains, we stopped at the side of the road. With a huge full moon shining down on the mountain view, we were astonished to see two full rainbows glistening in the bright moonlight! Long before cell phones or digital cameras, I wasn't able to get a picture of this incredible sight, but it has never left my memory. The mountains, the moon and two incredible rainbows! That is such a cool story! I had never heard of anyone seeing a rainbow at night before, so of course, I just HAD to google it! And sure enough, one's best chance of seeing a rainbow at night is when there's a full moon, as there was when you saw yours! Thanks so much for sharing your amazing story!